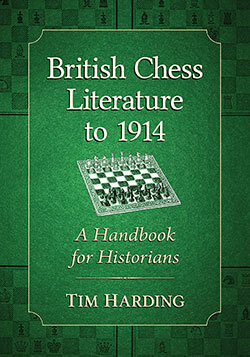 Here is the summary Table of Contents for Tim Harding's new book, British Chess Literature to 1914: A Handbook for Historians, just published by McFarland. The first four chapters are concerned with chess columns in newspapers and periodicals. Chapters 5 and 6 deal with chess magazines, and Chapter 7 with chess books. The final chapter is the author's personal view on doing ches shistory, including some specific advice on how to get the most out of, for example, visits to the British Library and the Bodleian Library in Oxford. There are also six appendices, of which the first (running to 44 pages) is a major reference guide to chess columns, correcting and supplementing Whyld's Chess Columns: A List for British and Irish columns up to World War One and, in come cases, beyond. The book includes many illustrations, including page images of some of the content described in the text. The book also includes a small number of (mostly little-known) games and diagrammed positions. Notes on old British Money and on Chess Notation. 1. The Earliest Chess Editors: Egerton Smth and Thomas Wakley. 2. The Heyday of Walker and Staunton. Covering especially the columns in Bell's Life in London, the first 20 years of chess in Illustrated London News and the column in The Era. 3. The Golden Age of Chess Columns. Covering roughly the period 1860 to 1885, including the heyday of the column in The Field (from Boden to Steinitz), the columns in Land and Water and the Illustrated Sporting and Dramatic News, and many other topics including Scottish, Welsh, and Irish columns. 4. Latter Years of the Chess Column. Covering the the start of syndication and the later chess editors of The Field (from Hoffer to Barden) and the Illustrated London News; also clearing up confusions over The Standard and some other columns. 5. A Short History of Chess Magazines up to 1914. From the earliest chess periodicals up to the Edwardian era, including some information about American chess magazines. While there is some detailed discussion of well-known magazines such as The Chess-Monthly and British Chess Magazine, the emphasis is on the lesser-known magazines which many readers may never haver seen or even heard of. 6. The saga of The Chess Player's Chronicle. Covering all the various series between 1841 and 1902, including a detailed look at the magaszine's origins in the short-lived British Miscellany. All the games and problems from that publication are included. There is some detailed discussion about the Chronicle's second editor (R. B. Brien) and about who may have edited the Third Series. The final section of this chapter includes detailed discussion on the lesser-known late volumes that appeared after the Rev. Charles Ranken (editor from 1877 to 1880) quit to help launch British Chess Magazine. 7. A Century and a Half of British Chess Books. After a brief review of chess books in English published prior to the nineteenth century, the author gives a personal review of a wide variety of chess books; it would be impossible to discuss them all. 8. On Doing Chess History Today. Including a discussion about libraries, archives and online sources. I. British and Irish Chess Columns to 1914: an Annotated List. IV. Contents of The British Miscellany. V. Some Amendments to Gaige's Chess Personalia.